Do you find yourselves doing some recycling of the things that can be functional while being stylish? Well if you have spare bicycle wheel in your stock room maybe you can do some craft for the kitchen. 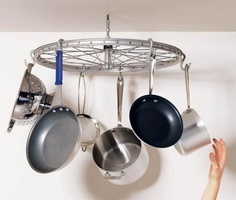 You can make a nice functional pot rack from a recycled bicycle wheel like the above image. It will not only add some decor to your kitchen but organize your pots as well. As pots seem a little messy at times you can make innovations with your old items to create something nice like this. So now every time there's a spare wheel in the garage I know what to do to maximize their usage and create something unique as well. Love the craft idea! What Is Included in Lawn Mowing Services?